Wake Forest and No. 24 Temple will play in the 2016 Military Bowl on Tuesday, Dec. 27 in Annapolis, Md. Here are Wake Forest’s five keys to the game, that if followed give them a chance to finish the season with its first winning record since 2008. Wake Forest finished first in the ACC this season in turnover margin (+8) – recovering 14 fumbles and coming up with 11 interceptions on the season. Temple turned the ball over 17 times this season, most notably by throwing 12 interceptions. If the Deacs can apply pressure to Temple quarterback Phillip Walker and force him into some hurried throws, players such as freshman All-American safety Jessie Bates III could have a chance to make some big plays. On the other side of the ball, the Wake Forest offensive line needs to have a big day against a Temple defense that ranks in the top 20 nationally in total sacks. The Owls have the potential to give junior quarterback John Wolford a lot of problems, especially if they are able to apply consistent pressure and disrupt passing lanes. Wolford has the potential to make big plays through the air – but it will require sufficient time and protection. When Wake Forest played in Annapolis’ inaugural EagleBank bowl in 2008, it found itself down 13-0 to Navy late in the second quarter. Led by quarterback Riley Skinner, the Deacs were able to comeback and score 29 of the game’s final 35 points to come out victorious in a 29-19 effort. I would argue the Deacs cannot afford to put itself in an analogous situation on Tuesday, however. A fast start on both sides of the ball is imperative for Wake Forest, especially against a Temple offense that put up 21 points in just 17 minutes against Navy a few weeks ago. Wake Forest ranks 39th in total defense and 33rd in third down defense. Conversely, Temple ranks third in total defense and 18th in third down defense. Strengths for both teams, the Deacs will need to be the better team on third down, both offensively and defensively. Its offense will need to be efficient on first and second downs to make third downs more manageable, and its defense will need to play effectively on first and second downs – like it has all season – to make third downs more challenging for its opponents. 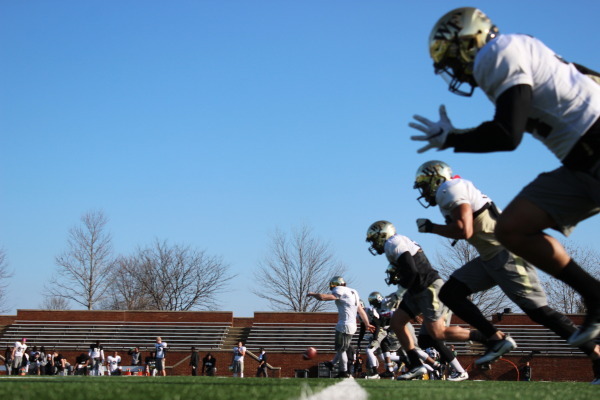 Winning on third down will extend drives offensively and on the defensive side of the ball will allow the Deacs to win the field position battle. There is a reason Wake Forest doubled its win total from a year ago. It became the best team in the ACC in turnover margin, became one of the least penalized teams in the country and continued its exceptional special teams play. Wake Forest needs to play at an elite level on defense on Tuesday afternoon. The best defensive end-linebacker duo in the country in Duke Ejiofor and Marquel Lee needs to have a big day putting pressure on quarterback Phillip Walker, and the Wake Forest secondary needs to be ready to make the big plays that have helped them win games all season. Averaging less than five penalties per game all season, Wake Forest needs to continue to play smart football. If it can continue to play without mental mistakes, the Deacs have the potential to give themselves a chance against a more talented Temple team. And finally, behind the play of freshman punter Dom Maggio and junior All-ACC kicker Mike Weaver, the Deacs will look to have an advantage in special teams play. Weaver needs to be ready to redeem himself after missing a potential game-tying field goal in the Deacs’ regular season finale against Boston College. Prediction: On paper Temple is inevitably the better team. It is one of the most balanced and consistent teams in the country and has the potential to put the Deacs away quickly. However, with the distraction of losing its head coach, combined with the feeling of disrespect for having to face a 6-6 bowl opponent in Wake Forest, I believe the Demon Deacons are set up to be the better prepared team for Tuesday’s game. Look for Wake Forest to play with more confidence and enthusiasm to pull off the upset of No. 24 Temple in the 2016 Military Bowl. Wake Forest wins 27-24.